When I first talked to Jennifer & Richard on the phone, they told me they wanted a really intimate destination beach wedding. They were bringing over only their kids and close friends they wanted to share those special moments with. Afterwards, we had a LOT of fun at the beach, having about 40 minutes of images, candids, and formal portraits. 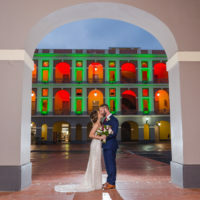 We stood there until sundown, after which we moved the party to Hotel Cielomar at Aguadilla, where they held an intimate dinner followed with a tasty red velvet wedding cake. It was a perfect evening! Hope you enjoy scrolling through these photos as much as I did capturing them! Cheers to the new couple, and I wish you a neverending honeymoon!